You must make reservations at least 5 minutes in advance of the time at The Glenville Stops. Street parking 200 yards away on Commonwealth Ave. Pockets of non-resident parking also on Harvard Ave, Park Vale Ave, Quint Ave, Long Ave, and Allston Street, as well as right outside our building. Please see our website for further details. Griggs Street on the Green Line's B train. From Cambridge, take the 64 bus (Harvard Sq.) or 66 bus (Central Sq.) to Commonwealth Ave. Your perfect date-night destination, the Glenville Stops nestles on a quiet, residential side-street reminiscent of London's quaint Chelsea district. Quality, flexibility, and especially share-ability are the hallmarks of Nathan Allen’s diverse, award-winning menu, from lamb meatballs to griddled cheese, from charred octopus to roasted beets in a ring of whipped feta. Come early for $1 Duxbury Select oysters. Enjoy a juicy Stops Burger, a vegetarian Masa Burger, or our unique, flavor-packed Confit Chicken Sandwich. Graze through small plates, or settle down to shareable entrées and innovative desserts. Complimenting Chef Nate’s Latin-Med inspired cooking, we have thirty-one world-class craft beers on tap, plus a cask-conditioned ale, and thirty wines by the glass, along with a full cellar featuring the finest Cabernets and Riojas. We had the gnocchi with pheasant to start which was so good. The food after that was not so great. I got a steak which was tough and not very flavorful. My partner got the chicken which was fine but pales in comparison to the starter. All of the small dishes looked very interesting so I may be back to try them. Though the entrees we had fell flat on their faces. I would recommend someone to go, but really only stick to the small plates. I would come back in a heartbeat! What a lovely place! The decor was relaxing and a little whimsical without being too forced, the lighting was just right, the prices reasonable, and the dishes delicious. We had a variety of selections and we each enjoyed what we ordered. The service was very good in that our server was perfectly pleasant. A little more attention would not have gone amiss but it was certainly sufficient overall. I have already recommended it to a friend! Cozy setting tucked away from the hustle of Comm and Harvard Avenues makes this worth the walk. Small plates were very interesting and uniformly good, and the walnut-pistachio baklava a great finish. We would return for a meal and setting that are a cut above the typical Allston experience. The food was delicious and inventive--very cool flavor combinations (Drunken Goat Cheese, Moroccan Beef Cigars) and savory goodness (Wild Mushroom Ravioli). The service was great, and the ambiance was perfect--lighting that was not too dark, and music that was not too loud. It was easy to appreciate it but also still have a conversation. And again, the food was amazing! We will definitely be coming back for more! This place feels like it could be in the middle of the suburbs although you're in Allston. It felt like we were right at home. They have a great menu. We did not like the oysters, we sent them back. I had the mussels and they were delicious. Please note they only serve wine and beer! We arrived early (6:30pm) on a snowy Saturday night and had our pick of tables. We chose a table for 2 in the room adjacent to the bar, and found the ambience to be extremely pleasant. The service was attentive but not intrusive, and very good. The menu is fairly short, but the choices were excellent and we very much enjoyed our food. ($25 Petite filet for her, and two $12 small plates of lamb meatballs and wild mushroom ravioli for him). Honorable mention to the bread for the table--it was excellent. The wine list lacked Prosecco (our favorite) but the Brut Cava ($40) was a very suitable substitute. The rest of the beer and wine list looked great, too. We will definitely return next time we are in the neighborhood. We found parking a few blocks away on Harvard Street in order to be close to our ultimate destination for the evening. Great neighborhood gem! This is a place where you can actually have a conversation with your friends (noise is pretty minimal) while having delicious food. Lovely birthday evening for the six of us. Thanks! Have been a few times now but went for dollar oysters and had a great time! It was evident that the Glenville Stops over expanded and could not keep up with a demand of a full restaurant. Service was very slow, and the waitress’ explanation was, “We have a small kitchen.” Unsure of why they added more space and tables if their kitchen cannot keep up? Nonetheless, the food wasn’t bad! Great date night spot. Seating was quick but food took a long time. Was disappointed at first but the quality of that food made us completely forget about the wait and the beer list was fantastic. Get the chicken. Big portion, crispy and flavorful. The mussels were meh. It's always a wonderful experience at Glenville Stops. Love it, especially now that we've figured out easy parking (on Comm Ave). Highly recommend it! Always love coming to The Glenville Stops - such a neighborhood gem. We love going with friends with whom we want to have good food and good conversation. You can share dishes and/or have your own. They have an appealing selection of wine and beer. My pescatarian veggie forward wife likes it. I am veggie if it works and like it. Until this last visit, we drove and parking is a challenge. Taking the Green Line was much more pleasant. Of course, taxi, uber, or lyft would work well. Great food and very nice cellar! Fantastic meal and great service! Love $1 oysters before 7 pm and we love the roasted chicken. Staff friendly. Owner was there and knows a lot about wine and beer. Great neighborhood gem. Creative food, and quiet atmosphere where you can actually hold a conversation without shouting. Excellent service, too. A neighbor gastropub with excellent service and food. Loved the happy hour oysters! Excellent food and wine. Warm environment. Even with all the tables occupied, the noise level is low, so table conversation is easy. This was our first time at Glenville Stops - a lovely spot with a varied, tasty menu and very friendly service. We were greeted poorly at the door saying there were no tables available even though we had a reservation. The host said she would come back, but no one came to tell us anything so we left. The spot looks nice and I have heard nice things about the food, but the service was poor. Glenville stops is a great place to go with friends. You can have your own meal and/or share plates. Good wine and beer options. The food selection is well varied. Take the T or taxi. Parking is a challenge. Great find off the beaten path. We were looking for an unusual dinner spot that was not to far from Symphony Hall. The Glenville Stops was perfect. Interesting and well prepared dishes served by a friendly and attentive staff. Great shareable Caesar salad as well as creative apps. We look forward to returning soon. Loved the website information! The food is amazing! I highly recommend the drunken goat cheese and the lamb meatballs. It’s kind on the expensive side, but it is really good food. Our spot was kind of near the kitchen and bathroom, even though we did make a reservation. The table was kind of too small for 3 people and was definitely made for 2 people. We had a very nice waitress that treated us well. It’s a great whole in the wall place with not much surrounding it, but definitely worth the trip. I have been here twice and would definitely go again. Definitely recommend. Good food and service. Excellent value and the oysters really hit the spot. Great place! The small plates were fantastic. We would definitely go back again. This is a true neighborhood gem. The food is creatively and wonderfully prepared. The service is superb and unpretentious. The ambiance is relaxed. Just a terrific restaurant. A true neighborhood gem. Surprisingly classy given the specific neighborhood. Loved our time here. It was cozy and cute and the food was really fantastic! Glenville Stops never disappoints. The menu is always creative and the preparations are delicious. The craft beer selection is unequaled - especially the cask ale. We try to get here at least one time whenever we come to Boston. I read the great reviews and was excited to try. The place has a fun neighborhood vibe but close to more action. On the positive the servers are very friendly and make you feel welcomed. I found the service to be slow and the food average. My wife's dish was very undercooked. Considering the slow service chose not to send back. Our server noted how undercooked it was when removing but did not even offer an apology for the cooking or service. We wished we stuck with basic bar food (burgers etc.). I would recommend for a cozy neighborhood find but can't recommend for the service or food. We chose this place based on Yelp reviews. Upon entering, we were unsure what to expect but the more we looked, the better it got! The food is quite good, not the simple ordinary fare, and the service is very attentive and friendly! Really excellent food. Wonderful small plates. 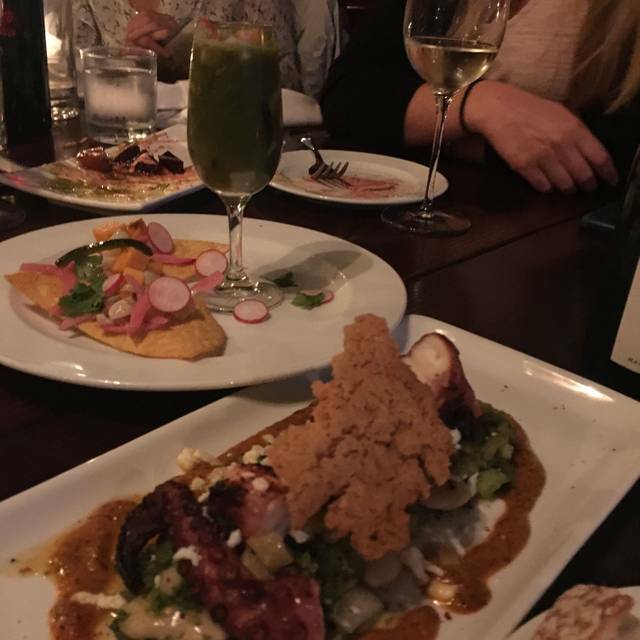 Try the octopus, sweet potato fritters, and goat cheese plate. This is the kind of restaurant you dream of finding in a local neighborhood. The food preparations are creative and exquisitely carried out, the service is informed and friendly, the ambience is relaxed, and the prices are reasonable. A real find.